New media has opened up so many options for making a career change that it would be a real waste not to utilise them. You no longer need to rely on unreliable recruitment consultants who say they’ll call you back and don’t, or send off unsuitable applications that waste your time and theirs. New media is available to everyone. It’s a great, democratic way to find a new job because you really feel as though you can make something happen. Getting to grips with how to use new media to your employment advantage is really not difficult. There are a few key websites that are the latest places for ‘getting yourself out there’, so you don’t need to be languishing on Friends Reunited any more! This is a highly respected website where you can put a professional profile of yourself up for other LinkedIn members to see and search for. The main advantage to LinkedIn is that you can ‘recommend’ people that you know in a professional capacity, such as ex-colleagues or great freelancers, with members able to see how many recommendations you have, giving weight to your profile. Take the time to write a decent profile – keep it factual and professional – this is not a site for jokes. Write a précis of your experience and give details of education, training etc. Some people like to put a photograph too – again, make it a smart, passport type photo rather than the one where you’ve got a cocktail in your hand on holiday. Use LinkedIn to find a new career by building your list of contacts and seeing who they know buy looking at their list of contacts. Update your status to show that you’re looking for employment opportunities. It’s also a good idea to be active in relevant LinkedIn discussion groups. Everybody’s talking about Twitter. It may be the golden site for ages, or it may fall by the wayside pretty swiftly, but, either way, at the moment it’s a great place to see and be seen. It’s easy to start up – go to the site and make yourself a profile. You can use your own name or something that shows more about your skills – TheCopywriter or WebGuru for example (these are probably already taken). It’s certainly worth uploading your website homepage as your background, or at least something to personalise your account. Use a photograph of yourself – not too wacky, or too plain. The get tweeting! Don’t just go straight for ‘I’m looking for work’ because nothing will happen. Follow people connected to your field and post relevant links to news stories that affect your business. 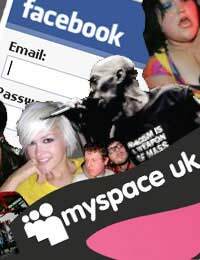 While many new media experts are saying that MySpace has had its day, with far too many new bands and teenage girls battling for attention that no serious people actually use it anymore, you can still get some mileage out of it, particularly if you’re looking for a job in the music business. It’s worth having a profile that you keep updated and you can use it to send to potential employers if you don’t have your own website. You have to be very careful with Facebook because lots of people have very personal profiles even when they have customers, clients or employers as their ‘friends’. It’s best to decide how you want to use Facebook and stick to it – have two profiles if necessary – but don’t be surprised if you don’t get snapped up by a potential employer if you’ve got negative comments about work, suggestive photos or generally unprofessional information on your profile. As long as you keep it ‘straight’ in terms of status updates, photos etc you can use Facebook to help find a new career by posting about looking for a new job, joining relevant groups or by asking professionals in your industry to be your ‘friend’ and then building a rapport with them.